Here's my card for the Less is More Challenge where week 221 the recipe is to use a TAG. I've just got back from a quick weekend down to Cornwall delivering my daughter back to University and to be honest I'd have loved to have seen this view. Alas it was misty, foggy and raining.....but at least it was better than the forecast thunder and lightening. 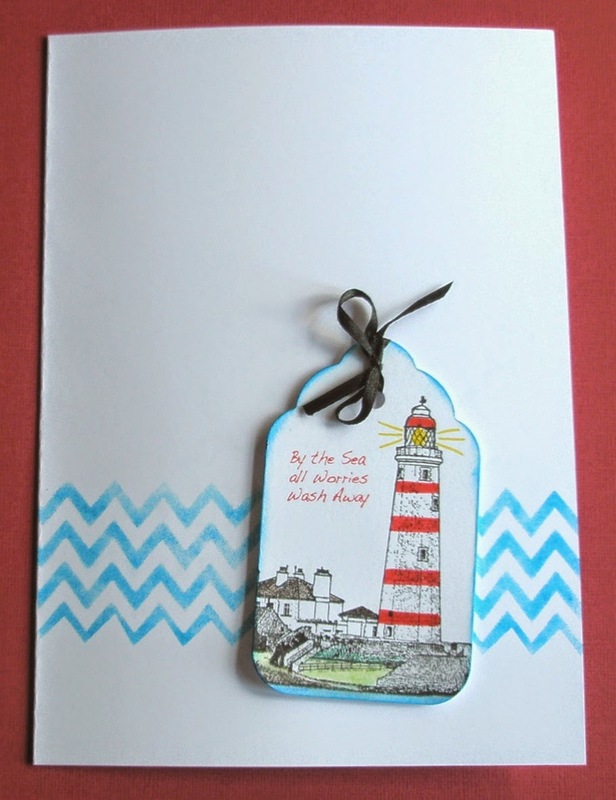 I've just created a little scene on the tag using stamps from Crafty Individuals (set CI-397) and the waves are Mermaid Lagoon Distress blended through a Studio Calico Chevron stencil. Sorry about the photo - the light is strange today - but thank you for visiting my blog. Oh what a lovely scene on your tag. Reminds me that summer will be here soon ( I hope). What a lovely little scene on your tag Elaine! Gorgeous tag and I like the waves you added behind! Great scene and sentiment and I like how you've edged your tag with the same ink as your 'waves'.